The miracle is he survived this early trauma without permanent lung or brain damage. The tragedy is his early years were plagued with chronic sicknesses, hyperactivity, delayed growth, dental cavities, poor vision, bursitis of the ankles and unexplained physical pains. When he arrived home for dinner, the perpetual diet of spam, hot dogs, hamburgers and fish sticks was not appealing. He was traveling through the universe at a million miles and hour, fueled by the incredible amounts of the sugar and caffeine he consumed with abandon of an addict. 1. Praised the virtues of rebellion against authority. 2. Battled against the repressive power of religion. 4. Encouraged the joys of mind-expanding drug experimentation. 5. Proselytized new disciples for the promiscuous sexual revolution. In December of 1971, right after his first great love affair ended in betrayal, the darkness of depression returned with a vengeance. His mind was disoriented by the EMF poisoning, psychedelic mushrooms and brain cell destroying LSD. His lungs were severely damaged from smoking pot, hash, Thai Stick, Ganja and other lung-killing concoctions that had appeared in plentiful supply. After moving to Whittier, Captain Biorhythm quickly realized why most people hated Los Angeles. The smog, traffic and the congestion was over-whelming. Wall-to-wall houses were depressing. There was no beautiful, pristine beach to flee to for peace and solace. The only beautiful part of his life was his second great love. Captain Biorhythm really noticed a powerful difference when people’s biorhythms were in the output state. He was committed to helping interested parties understand how to benefit from Biorhythm Awareness. He wanted to dispel the lies and mistakes about biorhythms perpetuated by the press. Most people did not know how to use biorhythms to their full advantage because of the partial truths promoted by the media. The explanation of biorhythms had been misrepresented by the press. There were only concerned with the most sensational aspects of biorhythms. The media focused on dates when movie stars and important people died. The media overlooked the real value of biorhythms that was the result of the research of brilliant medical doctors in the early 1900’s. The goal was to discover how to balance your hormones, biochemistry, exercise program and thought process so athletes and individuals will perform well, no matter what their biorhythm energy potentials were. Brain integration through ambidexterity, mind-mapping and drawing with both hands, Actualizations, EST and biofeedback caused a quantum leap in mental powers. Life Field Polarization neutralized the harmful effects of EMF (Electromagnetic Field Radiation). In 1981, Captain Biorhythm was Technical Director of Family Fitness Centers and a fanatical Soccer and Charger fan. Captain Biorhythm decided to volunteer to work with Rick McDonald, the head trainer of the San Diego Chargers under Don Coryell and Eric Geyer, the head trainer, assistant coach and a player for the San Diego Soccers under Ron Newman. He provided biorhythm performance predictions and astrological natal chart compatibility for each player and coach, trainer and assistant coach for every game. He learned about the harmful effects of electromagnetic field radiation. Suddenly, he realized why the un-shielded TVs, back when he worked for May Company, had affected him adversely without him even knowing. Captain Biorhythm discovered new research on muscle testing and experienced benefits from Life Field Polarization and subtle energy medicine. 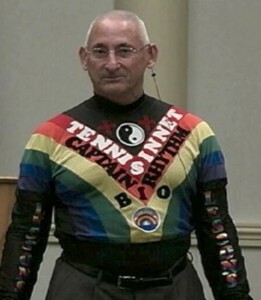 In 1983, Captain Biorhythm got involved with bio-medical computers that diagnosed imbalances in the body’s energy meridians. He researched this technology and worked on patients. Then he transformed the words into powerful mind-maps and super-learning PowerPoint videos to speed the assimilation of this valuable information. Andrew Carnegie commissioned Napoleon Hill to condense the key elements of success of the richest people in the early 1900s. He believed that if young people were taught his principles while young, his wisdom would cut the required schooling time in half. Internet video services like Youtube, FaceBook and all the other social networking sites now make the dissemination of the personal stories about family heroes easy, inexpensive and definitely possible world-wide. Captain Biorhythm’s Bio-awareness research has finally come full circle. After working with elementary school kids, male and female tennis students, professional athletes, business professionals, alternative medicine doctors, Internet millionaires and finally his dying parents, he now knows how to use his knowledge to promote individual health and happiness, international peace and world-wide wellness. After almost 53 years of health and human awareness research, Captain Biorhythm has discovered the seven most valuable elements of living a heroic super-life. You too can have victory over all the incredible challenges you face! 1. Seek a spiritual, personal relationship with God. 2. Develop a strong, extended family life that involves genetic dads, grandparents, sisters, brothers, nieces, nephews, aunts, uncles and step-parents, step-relatives and family friends. 3. Discover the truth of how boys and girls are mentally, physically, biochemically, psychologically and socially different from birth. 5. Achieve biochemical and hormonal homeostasis. 6. Pursue brain integration through recognizing and becoming friends with your non-dominant brain hemisphere hero, mind-mapping and ambidexterity. 7. Learn and internalize the teaching of Napoleon Hill in Think and Grow Rich. Captain Biorhythm is currently working on a Bio-awareness Program that incorporates the seven secret steps above for hospice workers, fathers, mothers, sons and daughters who have the courage and love to take of sick and dying relatives. His Bio-awareness Program is a powerful way of minimizing emotional suffering, physical exhaustion and catastrophic illness events. It is possible to maximize the enjoyment of life and each person’s natural human potential. Captain Biorhythm discovered the most effective therapies and mental drills to eliminate Biorhythm imbalances on critical and sub-critical days. He studied the research of Dr. Kichinosuke Tatai, MD, MPH, one of the most recognized and successful Biorhythm researchers and safety consultants in Japan in the 1970-1980s, who authored the book “Biorhythm for Health Design”. Dr. Tatai discovered biorhythm instability was caused by hormonal and brain chemistry deficiencies and imbalances. Stop the war in your mind between your two different brain hemisphere personalities.